TUSC has produced campaigning tools to help in this - the briefing document Preparing a No Cuts People's Budget, at http://www.tusc.org.uk/txt/355.pdf, and the recent TUSC report, How Much Reserves Have They Got?, available online at http://www.tusc.org.uk/txt/402.pdf. 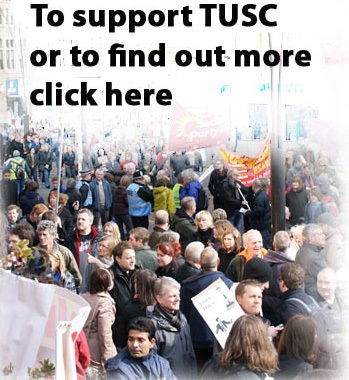 And now there is a questionnaire for local TUSC groups, as a guide to what needs to be done in the autumn period. What is certain is that if Labour councils were led by councillors determined to turn Jeremy Corbyn's anti-austerity message into action, they could play a critical role in forcing May's government out of office. There are 124 Labour-led councils across Britain whose combined spending power is greater than the state budgets of 16 EU countries! If they declared that they will use their borrowing powers and reserves to stop all cuts - in the expectation that they would be reimbursed by a future Labour government - what could the Tories do? Further, if there are elections, how far advanced are Labour's local candidate selections? And where candidates have been selected, have right-wing Blairites have been replaced by publically identified Jeremy Corbyn supporters? Gathering in this information on the situation now will help TUSC decide how best it can act to build support for Jeremy's anti-cuts position into the new year. The next TUSC national steering committee meeting takes place on November 15th.